This is a NEW Humanitarian Collaboration completely unlike anything that you may have seen before. It is the first time in history that humanitarian individuals, groups and organisations from around the world have begun to ‘Unite and Work Together’ to address ALL of the humanitarian challenges that the world faces today. Unity and common purpose is the key. By uniting our numbers, strengths, resources and voices into a single coherent message for the rest of society, we will be able to positively transform the world and address every humanitarian challenge today – including climate change. And you should know – this process has already begun! Already a number of humanitarian groups have made a commitment to make this happen. And that number will only continue to grow. Why? Because so many groups today realise that they are not strong enough to do this alone. They simply don’t have the numbers or resources to help make any real changes. However by uniting and working together – they do! To that end, a set of humanitarian directives and principles have been put in place which they all share in common. Through global collaboration, they will be achieved. A major catalyst of this process will be the ‘LONDON 2014 Humanitarian Conference’ this year. It will help to take this message to the rest of the world and also outline the strategy and focus of this Global Collaboration. The University Student Community has a very important role to play in this process. We would like to see the same show of unity across the Student Sector, with a Keynote Talk being delivered by Student Union Representatives at the Conference. Due to there being over 150 University’s in the UK, we need to first assess who wishes to participate in this Conference, and have therefore currently taken the following steps. If you are a London based University, some posters (as to the right) may have already been delivered to you, to inform students about the Conference. If you have not received these, please let us know. Early next year, it is also our intention to drop in and speak with those of you that would like to play a more active role in this Conference, and to answer any questions that you may have. For all universities outside London that would like to participate in this Conference, we would love you to be involved. Simply contact us by email confirming your interest, and we will mail posters and other promotional material to your locations as well. 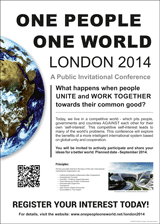 The contact email is london2014@onepeopleoneworld.net. You should understand that this is a collective effort to engage the world on a level of humanitarian global collaboration never before previously seen. Yes – we have all protested wars and other injustices in the world. This is not a protest – but a Global Campaign to bring to the world a ‘practical organised solution’ to address every humanitarian challenge the world faces today. You have an important role to play in this historic process. Please feel free to contact us at any point with questions, feedback or suggestions. If you require more information, you can also visit the website – onepeopleoneworld.net. Here’s to a fantastic new year! Let’s make sure 2014 is one for the history books.